The infamous polar vortex of 2014 lowered temperatures all around Wisconsin, with temperatures in Stevens Point reaching as low as negative 26 degrees and brutal wind chills reaching negative 50 degrees. Brrrrrrrrr! So, what exactly was that polar vortex? Contrary to popular belief, it wasn’t just a one-time thing. The term “polar vortex” actually describes an atmospheric phenomenon that regularly occurs over Earth’s polar regions. In the winter, the poles receive little heat from the sun, which causes much lower temperatures and air pressures compared to mid-latitude areas of the globe. This difference in air pressures creates strong westerly winds, known as the polar jet streams, that each encircle the polar regions in a spinning vortex, trapping the cold air at the poles. While a polar vortex is typically contained over the poles, changes in conditions can allow the frigid air to escape and invade lower latitudes. In particular, the Arctic Oscillation is the pattern of changing pressures over the Arctic relative to pressure systems further south. When pressure is high in the Arctic region and low in the mid-latitudes, the Arctic Oscillation is said to be in the negative phase, which causes distortions to the polar jet stream, allowing colder Arctic air to escape to the mid-latitudes. This is exactly what happened on January 5, 2014, during last winter’s polar vortex event. Figure 1 illustrates this below. 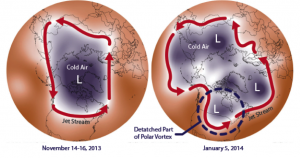 This figure shows the extent of this jet stream disruption and polar vortex expansion on January 5, 2014 compared to the typical extent of the polar vortex.